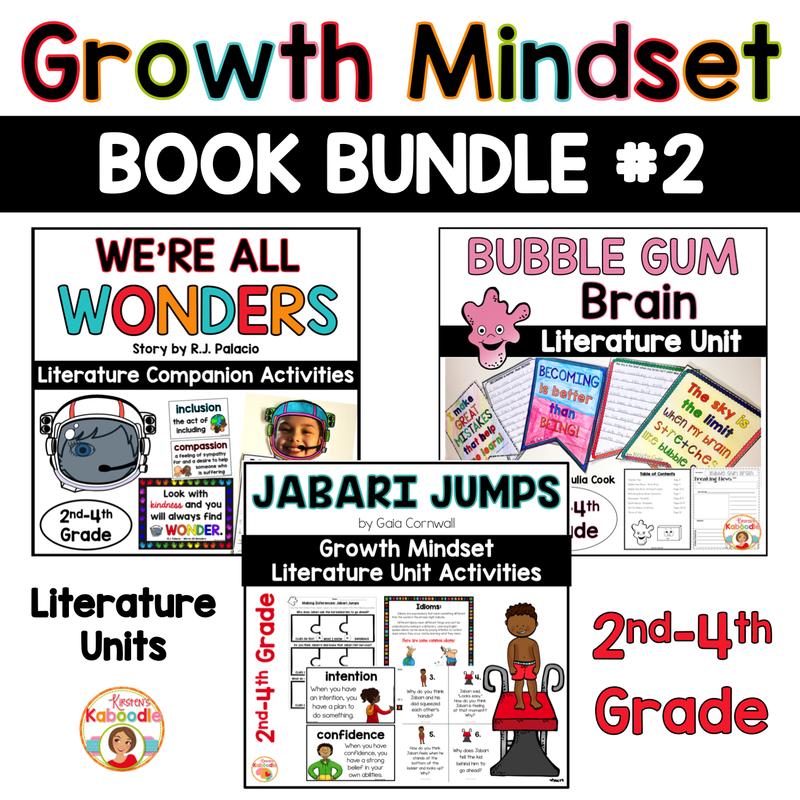 This bundle includes activities for We’re All Wonders, Bubble Gum Brain, and Jabari Jumps. These literature units were created for 2nd, 3rd, and 4th grade. This spectacular picture book teaches kids about compassion, inclusion, and embracing unique characteristics! We’re All Wonders contains a powerful message for elementary students! This product was created for 2nd-4th graders (though you can modify it to use with grade levels outside this range). 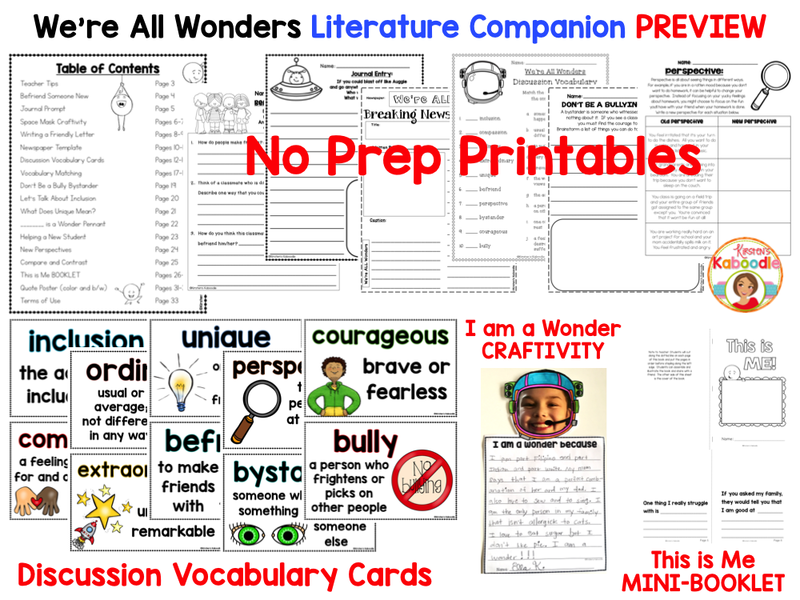 This product includes teacher tips, journal prompts, no prep printables, a newspaper template, a craftivity, vocabulary for discussion, a mini-booklet with sentence starters on each of 8 pages (half-sheets), compare and contrast, a quote poster, and discussion activities that are sure to get your students thinking about how they can make this world a better place, one wonder at a time! This new book by Julia Cook is a winner for any classroom teacher that is trying to instill perseverance and growth mindset with their students. Though the book itself is appropriate for any elementary classroom, this literature companion was created for 2nd-4th graders in mind. If you teach a grade level above or below that, please check the preview and thumbnails prior to purchasing (or contact me with questions). 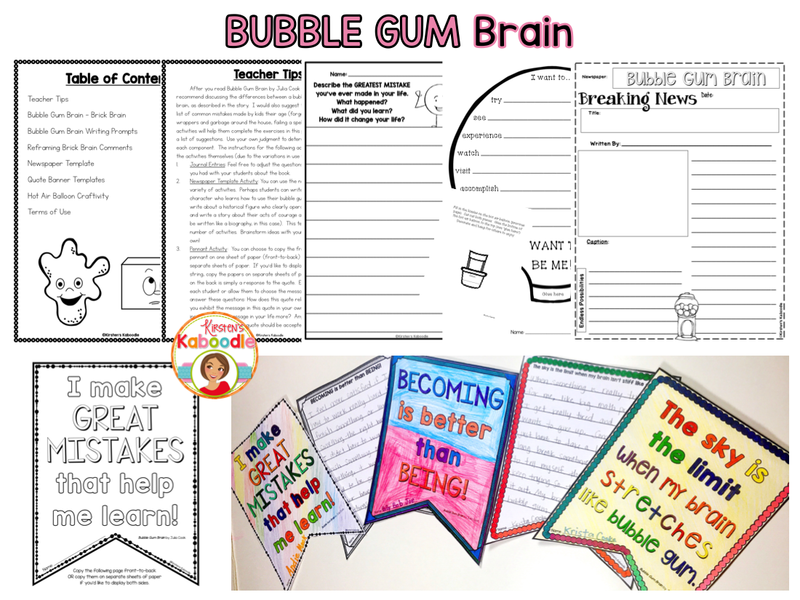 This literature unit for Bubble Gum Brain includes the following: Teacher Tips, Bubble Gum Brain and Brick Brain printable, 2 writing prompts, reframing brick brain comments, a newspaper template, quote banner templates (5 quotes with corresponding writing pages to be printed front-to-back or on separate sheets), and a hot air balloon craftivity. Jabari Jumps by Gaia CornwallThis growth mindset literature unit for Jabari Jumps by Gaia Cornwall is perfect for 2nd-4th grade. This new picture book works perfectly in conjunction with any growth mindset curriculum. The activities in the literature companion focus more on the concepts presented in the story and less on the content (although there are comprehension questions included in list form as well as task card form). In addition to 6 vocabulary cards, 14 discussion question task cards, and various printables, you will also find a variety of tasks where students can reflect on setting goals, taking risks, and facing fears. You will also find several pages of information and anchor charts related to figurative language (idioms, similes, and metaphors). 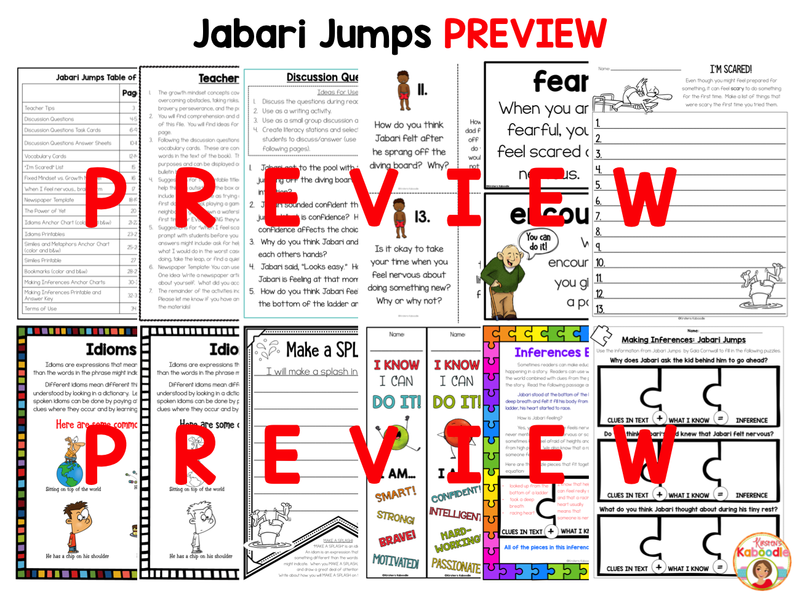 Please check out the preview for Jabari Jumps prior to purchasing and let me know if you have any questions! 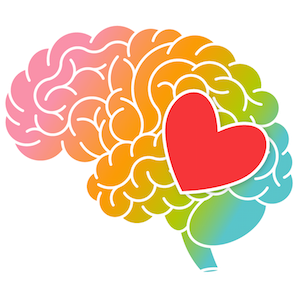 These activities are perfect for teachers or counselors who are helping students develop a growth mindset and understand that it’s normal to have fears and anxieties. Please let me know if you have questions prior to purchasing this literature unit. This file contains 89 pages.